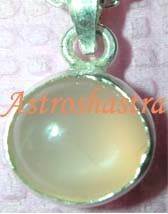 Moon Stone gemstone is a potassium aluminum silicate member of the feldspar family. It is a translucent, milky-white stone with a hardness of 6-6 1/2 and a monoclinic crystalline structure. The alternating layers of orthoclase and albite feldspars cause its shimmering effect. When these layers are thin and you hold a moonstone up to reflected light, you will see a beautiful blue-white glimmer. It is associated with the moon and was the stone of the Goddess Diana. This is a reliable stone that has been described as the 'Mother Earth'. 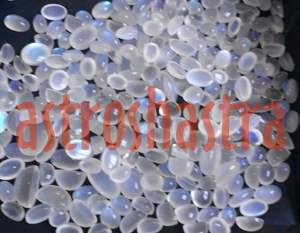 Moonstone is soft milky white stone, the most valuable variety of feldspar with a rainbow sheen. The most powerful time to use the stone is on a full moon day. It is protective of women and nature, and is a sacred stone of the Moon goddess. It is usually polished as a cabochon, and is often carved with a moon face. It helps to soothe and balance the emotions. It will help achieve a balance between heart and mind without losing the gentleness and caring needed. It inspires flexibility, nurturing and wisdom. Used to counteract negative emotions and healing of the spirit. It is an excellent stone to use in meditation to understand oneself. Brings success in love as well as business matters. It brings insight, perception and discernment, encouraging you to trust your intuition when making decisions. Legend: United States astronauts Neil Armstrong and Aldrin landed on the Moon July 20, 1969, preparing for man’s first personal inspection of the lunar surface. Ten months later, on May 20, 1970, Florida lawmakers passed and sent to the Governor a bill adopting the stone as the official State Gem. Some ancient people wore moonstones to protect them from epilepsy and sunstroke. Early Romans believed It captured moonlight. Where is it Found: Brazil, European Alps, India, Madagascar, Mexico, Myanmar, Sri Lanka, Tanzania, and USA (Pennsylvania and Virginia), Sri Lanka.